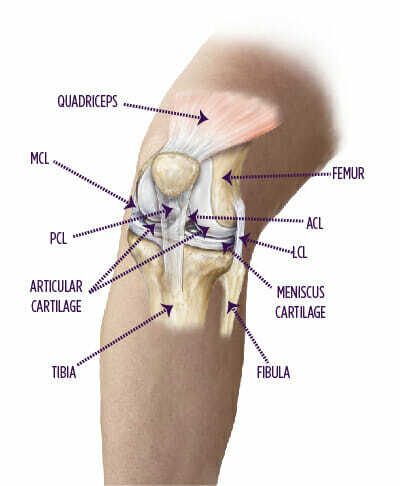 The knee is a hinge-like joint made up of various muscles, ligaments, cartilage, and tendons. These four ligaments act collectively to support and stabilize the knee throughout its range of motion. The quadriceps and hamstring muscles are responsible for extending and bending the knee. The meniscus cartilages and articular cartilage are located inside the knee joint, between the thighbone (femur) and the shinbone (tibia). They act to cushion the knee and prevent the opposing bones from coming into contact with one another. What are the treatment options for knee injuries? Placing a bag of ice directly on the knee for 20 minutes prevents swelling and inflammation from occurring inside the knee. Over-the-counter medications such as Aleve, Advil, Motrin, and aspirin can help reduce swelling and pain. In the specialist’s office, medication is injected directly into the joint. Injections can provide lasting relief of pain and swelling. A therapist can work with you to first control your pain and inflammation. They then will help you regain your strength and range of motion. Start with a free wellness consultation to explore your goals and what tools are available to you. Our team of physical therapists, performance specialists, and registered dietitians works collaboratively with you to design an integrated rehabilitation plan that will help you reach your full potential.